I did go out Saturday night. A friend had a night of sitting around a fireplace, reading poetry and essays, doodling, and snacks and drinks. It started right around when the blizzard hit, which made it extra cozy, and since her house was only 10 minutes away, I’d walked there and had a lovely midnight walk home in a half foot of still-swirling snow. It was nice to have a break from work for a few hours to go to such goodness. Also, because of the orders, I’ve missed the last two model-drawing sessions. but since this was a night of reading and doodling, I doodled my friend’s living room mantle. Good times. She comes from a planet where people get hammered every night. @Christopher, like the mantle doodle. Given the angle of the lampshade and the lamp, is it safe to assume your friend is owned by a cat? @Coyoty and in the morning they really feel it :3 small dudes hitting your head with miniature mallets. 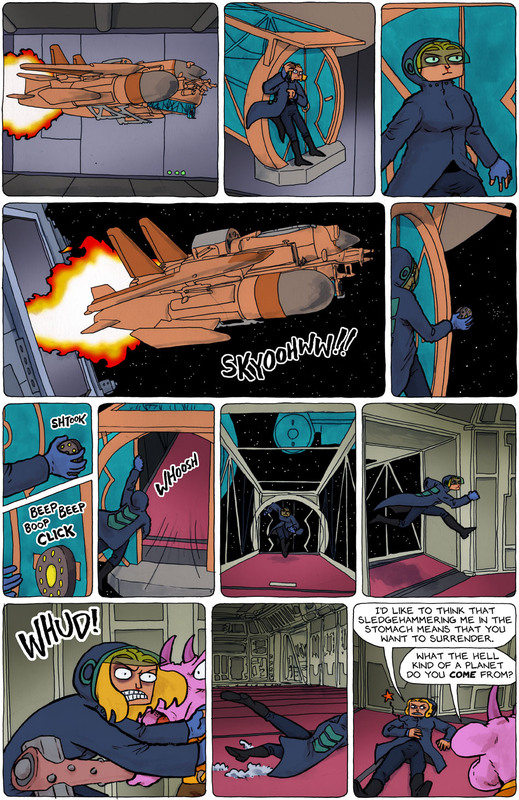 So in panel #9 Emily uses the weakened gravity and ship’s acceleration to fly while running. Damn, I wanna do that. @Muzhik, yes! Both lamps were drawn at the angle they were at, and I suspect the cat. Yay! I got my artist doodled book in the mail on Saturday, right before I went out to the latest Hobbit movie before the blizzard hit. Talk about your good days! I asked for Dimitri shocking himself with a stun gun and you didn’t disappoint. Awesome Christopher, thank you. So… it’s a steam train and an F14 Tomcat and a Portal 2 testing facility and an oil rig and a podracer. @Christopher, wow. How did I possibly know that? It’s like I must be psychic or something. I love this glimpse into your process. I assume all the solid black lines are reference 3D models that you’ll be tracing over when you do the inking? I’d wanna see a comic of just Emily and Pierrot: Space Adventurers! One where this is light stuff, you should see what we do to our pumpkins, turkeys, and trees to celebrate a holiday. 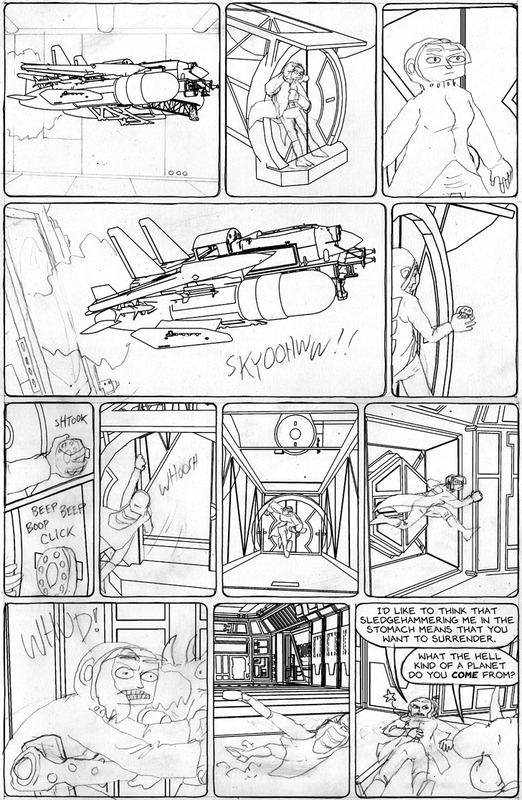 @RedDwarfIV, and once it’s inked, washed, and colored, it will simply look like a spaceship. Neat! @Egypt Urnash, exactly! And the background models can be sloppy, because I fix ’em up when inking. Man that is such a timesaver. What’s your toolchain for this – have you written anything about it? I’ve been dabbling with 3D for a swoopy car in my comics, and may try doing more in future projects. My current process is to loosely model stuff in Silo, then match the model to my rough layout in Photoshop and work over that in Illustrator. @xyxz, Ha! How could I forget. Yes. Will be done. This week I’m finishing up the Girl Genius pages, and shipping out the final push of Spacetrawler books. So, next week it SHOULD be done.